In the United States, July 4th is a day of celebration, and in many ways it reaffirms America’s belief in its destiny, especially ‘Manifest Destiny’. In Germany, if there is a day that is similar to America’s July 4th, it would be 9 November. It is the day that the Wall separating East and West Germany started to come down, and from the ruins a stronger, united Germany rose. In the nearly 30 years since the fall of the Wall, that one Germany has become the undisputed leader of Europe. But whereas America’s July 4th is a ‘Day of Destiny’, and has only positive connotations, Germany’s November 9th is a “Schicksaltag’, or Fateful Day. And though the recent celebrations have given most Germans a time to reflect, and for many, an opportunity to celebrate their good fortune, November 9th is not a good day in the annals of German history. 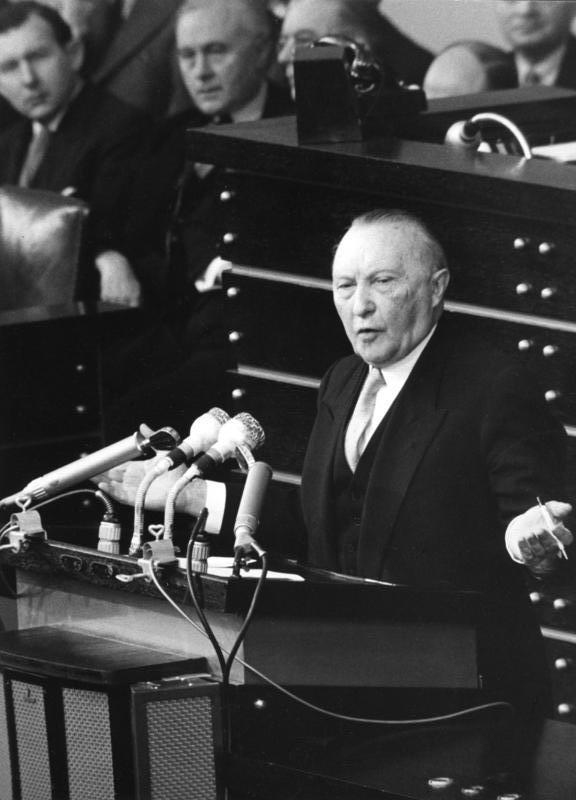 Konrad Adenauer, exactly the right man at the right time for Germany. Any expat who lives in Munich, and has been here for more time than quick trips to Dachau, BMW Welt, and the Hofbrauhaus take, will invariably conclude that there is a melancholic undertone lurking in nearly every German you meet. Hidden in the darkest recesses of their character, it manifests itself in an abundance of skepticism and cynicism. A long history unlike any other, tempered in ‘blood and steel’, Germans have been both both the provocateurs and victims. Americans on the other hand are only learning how to be good cynics and skeptics. The whole history of America has been written by America, and as the winners (in their collective minds), it has been full of joy with little sorrow. Most of the sorrow in America’s history has been a result of fratricide. Here’s a staggering statistic: the number of killed in America’s Civil War is greater than the number killed in ALL OTHER CONFLICTS COMBINED. It is little wonder Americans feel in some ways they are a chosen people. 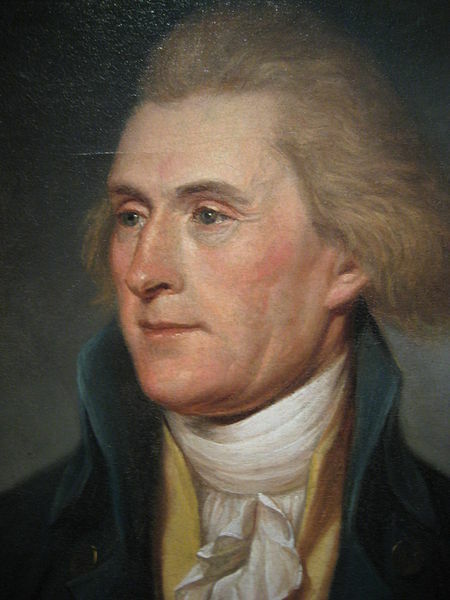 Virginian Thomas Jefferson was instrumental in building the American government. He became the third president of the US. He died on the same day as Bostonian John Adams, the second president of the US, on 4 July 1826, a cool 50 years after writing the Declaration of Independence. On July 4th, 1863, the Union forces from the North won two important battles that sealed the fate of the Confederacy. Gettysburg in the east, and Vicksburg on the Mississippi River in the west, wounded the South mortally. Though the Rebels continued fighting another two years, there was little hope for their independence anymore. Two other great moments of America’s cultural journey fell on July 4th. In 1855, Walt Whitman’s monumental ‘Leaves of Grass’ was published. Many experts believe it is the official starting point of serious American literature, in a style that was pure American, without any remnants of Europe’s influence. American art had arrived. In New York’s Yankee Stadium, The Iron Horse, Lou Gehrig, gave a rousing speech retiring from the game of baseball he loved so dearly on 4 \July, 1939. He had played in 2,130 consecutive games before being diagnosed with Amyotrophic Lateral Sclerosis (ALS). It is known as Lou Gehrig’s disease in North America. Though Gehrig would be dead in two years from the disease, he declared he was ‘the luckiest man on the face of the earth’ that day in Yankee Stadium for having been able to play for so many seasons in that stadium with those fans. 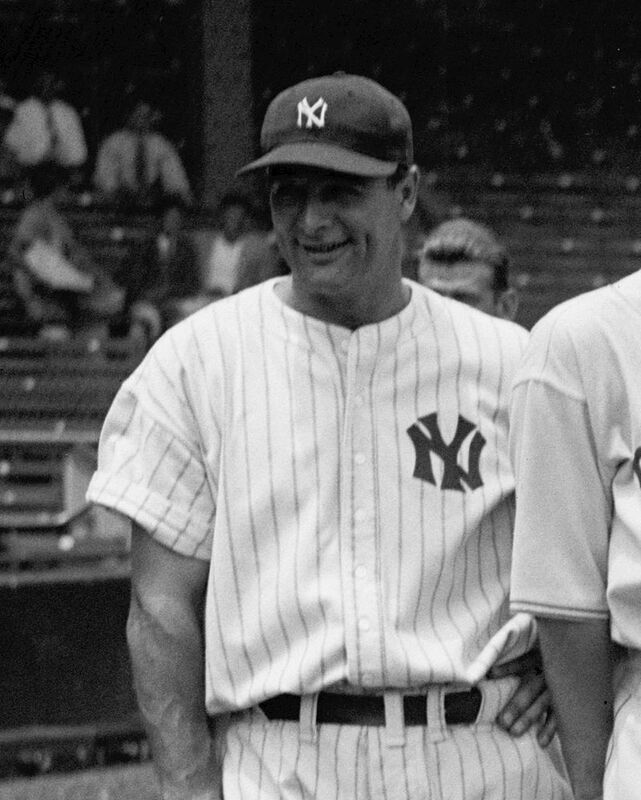 The ‘Iron Horse’ Lou Gehrig was a key component of the New York Yankees. His name is synonymous in America with dedication, perseverance, and the disease that cut short his life. The contradiction that is Germany is summed up by its Fateful Day. Moments of darkness in its history are balanced with brilliant light. 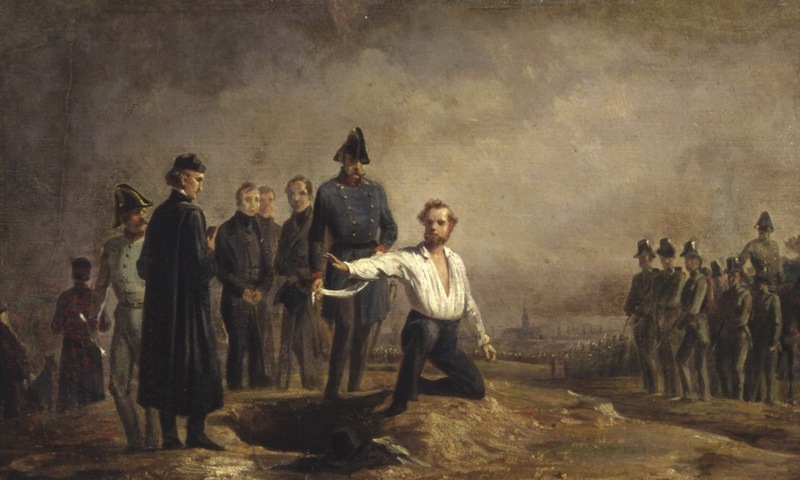 Though the idea for a unified Germany began earlier, the first real attempts can be traced to Vienna, where Robert Blum, a liberal leader of the German Revolutions of 1848, was executed by Austrian soldiers. Blum and others believed that Germany should be separate, and independent of the Austrian Empire. Though he became a martyr, his death effectively ended any hopes for a unified Germany at that time. The execution of Robert Blum, by the emperor’s troops. Blum became a martyr for the cause of a unified Germany. Seventy years later in 1918, Philipp Scheidemann, an upper-ranking of the Social Democratic Party of Germany (SPD), gave a speech to a large crowd of people from the Reichstag (Parliament Building). Though he was not qualified to do so, Scheidemann declared that Germany was now a republic, thwarting the efforts of the Communists to declare Germany a Soviet Republic. And so, Germany became a republic. Three years later, the whole incident was captured in the novel Der 9. November by Bernhard Kellermann, which was critical of German soldiers during the Revolution of 1918. This brought him much trouble later. 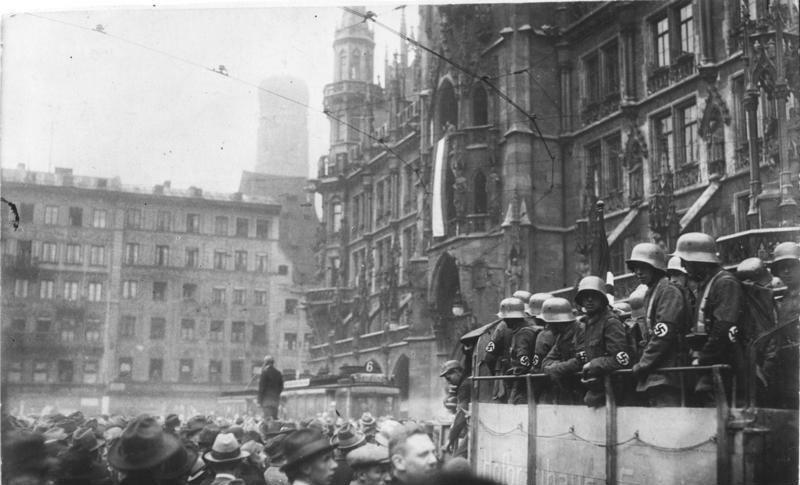 In 1923, a former corporal from the Bavarian Army (part of the German Army) declared in a Munich beer hall that a revolution had begun in Germany. Adolf Hitler, a mostly heretofore unknown politician, led 2,000 followers in an attempt to take over the Bavarian Government. Though unsuccessful, the Nazis led by Adolf Hitler would become a force of terror and death a decade later after their failed attempt to seize power in Munich, in 1923. The ‘Beer Hall Putsch’ led to the death of 4 policemen and 15 Nazis (a waiter was killed by a stray bullet). A plaque was erected by the Nazis after seizing power on the east side of the Feldherrnhalle (Field Marshal’s Hall), at Odeonsplatz. Citizens were required to give a Nazi salute when passing the plaque. In order to avoid giving the salute, many pedestrians coming from Marienplatz turned left on Viscardi Alle behind the Feldherrnhalle. It is known today as the the Drückebergergasserl (Quitter’s/Shirker’s/Dodger’s Alley). Destroyed synagogue Ohel Yaaqov, in Munich. There is a monument today commemorating this woeful act behind the Oberpollinger store in Munich. And then things went from bad to worse. On that fateful day in 1938, the rest of the world watched in horror as the Nazis showed their true colors. They rounded up as many as 30,000 Jews and incarcerated them in concentration camps. Hundreds of Jews were killed. 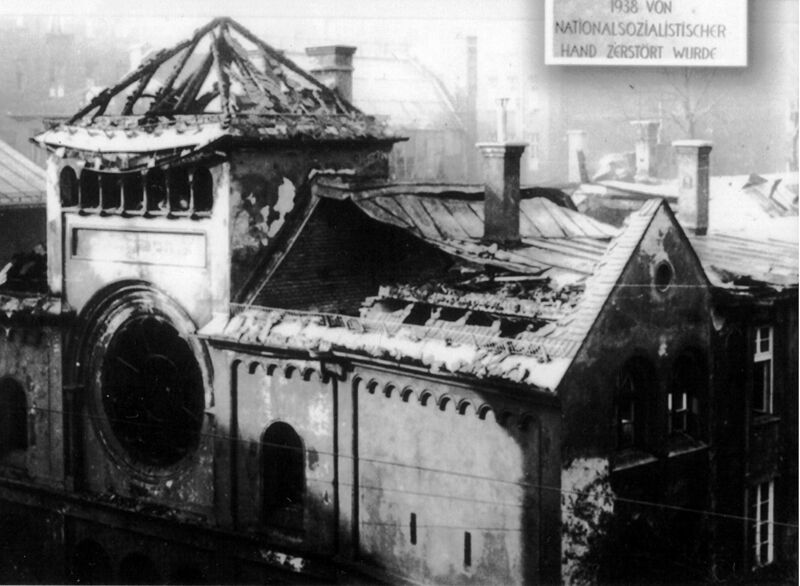 This is known as Kristallnacht (Crystal Night), due to the shards of broken glass that littered the streets. 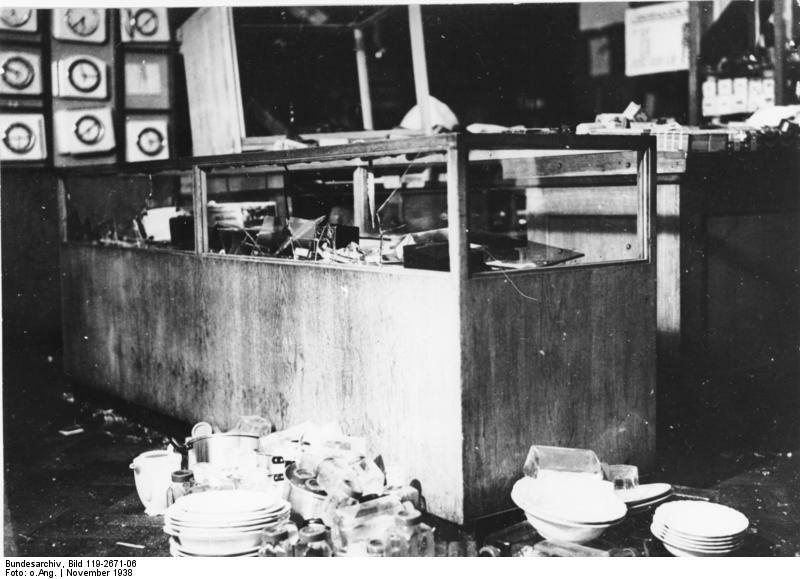 Destruction at a Jewish owned department store in Munich. The last event – and this may be the greatest of them all on this Fateful Day – was the fall of the Berlin Wall. After months of East Germans ‘travelling’ to Hungary and then crossing an open border from Hungary to the West, peaceful protests centered in Berlin began to demand free travel to the West. When it became clear that the Soviet Union would not send troops in support of the German Democratic Republic (GDR), the stage was set for opening the Wall. It was decided on 9 November to open the crossings the next day, but the person who was to announce this was not told it was to be in 24 hours. Caught unawares, he instead said it was to be effective immediately. At 10:45 pm or so, the border guards opened the gates and the East Germans poured through. They were met by equally ecstatic West Germans who greeted them with bubbly and flowers. 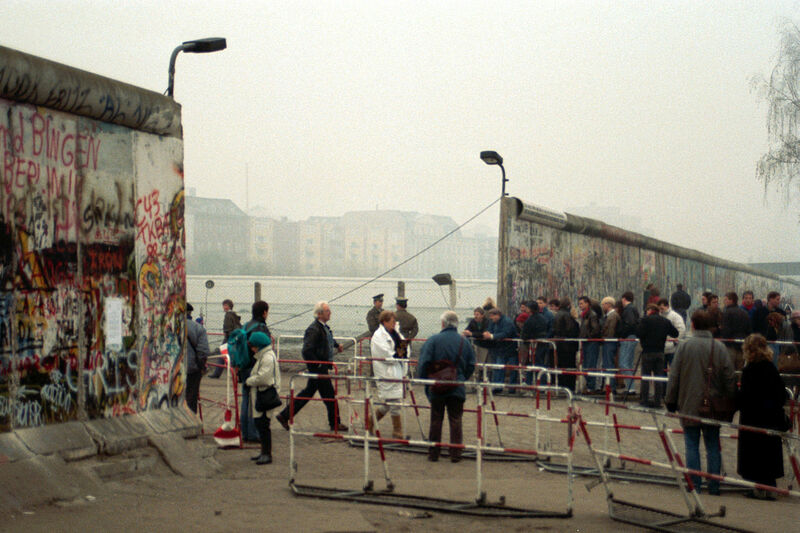 A steady stream of East Germans began crossing into West Germany shortly after the Wall fell. Some were tourists, others stayed in West Germany, never to return. When it came time to assign a day of celebration for this event, it was decided that November 9th was too controversial. In order to avoid any controversy, Germany decided to celebrate their National Unity Day on October 3rd, the date when their reunification was finalized in 1990. But as fate would have it, and in a country whose history is so long and full, there is no day completely free of sorrow. Bavaria’s most important politician since the end of the monarchy, Franz Josef Strauss, died on October 3rd, 1988, while hunting near Regensburg.